Pretty much all of the widely-followed stock indexes gained ground last week. A notable exception was the Dow Jones Industrial Average which lost all of 5 hundredths of one percent. For the week, the average U.S stock gained ½% with foreign stocks advancing somewhat less. So on balance, it was a yawner, as further evidenced by low trading volume. But that’s not so bad after the stellar advances earlier in the year. In addition to an abundance of further first quarter corporate profit reports this week, investors will look for indication of the Fed’s intention on interest rates and any progress on trade talks. One bit of good news is that the interest rate yield curve is no longer inverted as it was a few weeks ago, sending shivers through the investment community. A protracted inversion is a fairly potent sign of an impending recession. The majority of actively-managed mutual funds underperform their benchmark indexes. While actively-managed mutual funds struggle, most garden-variety exchange-traded funds (ETFs) and index mutual funds do what they are supposed to do: generate average investment returns. ETFs are like mutual funds in that they hold a portfolio of individual stocks and/or bonds, but ETFs are bought and sold on the stock exchange rather than from a mutual fund company. Most ETFs are designed to achieve the returns of a particular stock index, like the S&P 500 – no more and no less. An index mutual fund is very similar to an ETF in operation. The primary difference is that you buy an index fund from a mutual fund company rather than on the stock exchange. Most investors can’t even manage to keep up with the stock index averages, so just being average with ETFs or index funds can put you in the top half of the investor class. It is possible to find mutual funds that pretty consistently outperform the index averages, but you or your investment advisor need to devote the time necessary to identify and monitor them. What’s the solution? Like every other area of your financial life, deciding between ETFs and index funds or actively managed funds is not an “either/or” decision. Why not some of both? Increase the deductibles on your insurance policies. You can save some money by increasing the deductibles on insurance policies. If you can afford it in the event you have to file a claim, consider deductibles of $1,000 or more on your homeowners or renters and your auto insurance policies. You’ll be pleasantly surprised at how much your premiums will decline. If you’re in the market for long-term care (LTC) insurance, increasing the waiting period until the policy benefits kick in (called the “elimination period”) will reduce the annual premium but should be considered only if you can afford to pay the substantial initial care costs out of pocket. Remember that you are investing for the long term. The multi-year advance in the stock market may be losing steam if recent performance is any harbinger. Flat, if not declining stock, bond, and real estate markets are not that uncommon. But unless you recently got a terrible prognosis from your doctor or you are going to need a chunk of money to acquire something in the near future, you’re investing for the long term. That means any decline in your investments will most likely be more than offset by even larger gains in the future. No matter how badly the markets are faring, no matter how dismal the prognoses of the pundits, market travails will be just a faint memory a decade later. It’s tough to stand pat when you’re losing money, but that has always been a wise thing to do. Do you have family members, friends, or colleagues who could benefit from receiving Ponderings each week? Subscribing is simple, free, and no strings are attached. 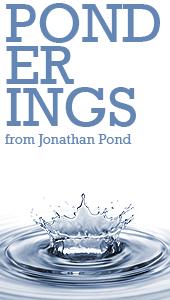 Simply click on: www.ponderings.info and enter the recipient’s email address. Anyone may arrange his affairs so that his taxes shall be as low as possible; he is not bound to choose that pattern which best pays the treasury. There is not even a patriotic duty to increase one’s taxes. Over and over again the Courts have said that there is nothing sinister in so arranging affairs as to keep taxes as low as possible. Everyone does it, rich and poor alike and all do right for nobody owes any public duty to pay more than the law demands. I’m proud to be paying taxes in the United States. The only thing is – I could be just as proud for half the money. cockalorum – noun (KOK-uh-lor-uhm) – A self-important or boastful person. It would be easy for us to become demoralized by the cockalorum who runs our department if we didn’t know that his family life is a mess.